These numbers reflect estimated student expenses for the 2019-2020 school year. Amounts will change slightly from year to year, but as the cost of college increases, the scholarship packages will correspondingly increase. Your official financial aid award will be included in a letter directly from Duke. If you receive need-based aid from Duke, your aid will include work-study. Any funding you receive will first replace the work-study you were offered. If you receive more in outside funding than the total work-study you were offered, the additional amount will reduce the need-based Duke grant or scholarship amount. All students are required to maintain adequate medical insurance during their enrollment at Duke University. If you are receiving need-based aid from Duke and don't have access to other insurance, the cost can be covered by financial aid. Transportation costs are determined according to the parents' state of residence and are included in each student's budget. These allowances represent either two economy-class round-trip airline tickets or a fuel allowance for those whose parents reside in states bordering North Carolina. Transportation amounts for students living abroad are based on one economy-class round-trip ticket per year. Students are responsible for making their own travel arrangements and utilizing their summer work contribution to cover the up-front costs of travel. Duke’s need-based financial aid policies require that Duke only offer admission through the National College Match to high financial need students whose parents qualify to make near zero or zero contribution to college costs. Students who do not have high financial need will be considered for admission to Duke during the Regular Decision program and will still qualify for extremely generous aid calculated to meet full financial need. Duke is strongly committed to its financial aid program and the principle that a student's financial resources should not be a barrier to enrollment. We pledge to meet full demonstrated financial need for every one of our students. For U.S. citizens, permanent residents, and undocumented or DACA (Deferred Action for Childhood Arrivals) students, Duke's admissions policy is "need-blind," which means that applicants are accepted based on their merits, regardless of their ability to pay for college. 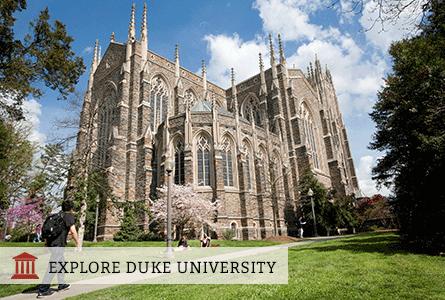 If you are admitted to Duke, we want to make it possible for you to be here. Our goal is to allow every admitted student to choose us. We view our financial aid program as an investment in students and their futures; that's why we are fully committed to our need-based financial aid program. Over half of our undergraduates receive some form of financial assistance. We admit U.S. citizens, permanent residents, and undocumented or DACA students without regard to their financial circumstances or aid eligibility, and we meet 100% of demonstrated need for these students throughout their undergraduate enrollment. For instructions on how to apply for need-based financial aid, visit the Karsh Financial Support Office website. If family circumstances change, students who did not apply for need-based aid when they applied may apply at any time during their four years at Duke. We seek a diverse student body and are committed to ensuring that all students can take full advantage of the Duke experience.